As I was perusing my shiny new copy of the Player’s Handbook in my easy chair a few weeks ago, my thirteen year old son asked me a question. “Hey Dad, does that have the rules for making a barbarian instead of a fighter?” Nodding, I flipped back a few pages, opening the book to the well-rendered portrait of an impressive barbarian accompanying the class description, and handed it over to him. Curling up on the couch, he started reading. At first, he was a bit distracted by whatever was on the TV screen at the time. Within a few moments, he had assumed a more comfortable pose, the Player’s Handbook on his lap, turned away from the TV. I watched him closely. As he read, his eyes widened, nose inching ever closer to the pages of the book. The TV was forgotten; he was enthralled by the fantastic tome, oblivious to the world around him. He only came out of his trance long enough to share the most incredulous bits. “Dad! Did you see this? The path of the totem! You can be like a bear!” He was only distracted from his reading by the arrival of supper. Watching this unfold in my living room was a special moment. I got my wife’s attention, pointing at our boy. “That right there on the couch is me twenty-something years ago,” I whispered to her. And it’s true. I was very much the same at his age, spending time playing video games, reading comic books, and devouring Dungeons & Dragons material. In my case, it was the Red Box Basic Set. In his case, Fifth Edition. In most respects, the experience was the same. The sense of wonder has always been D&D’s biggest appeal to me, and the latest version of the world’s greatest role-playing game provides this in spades. 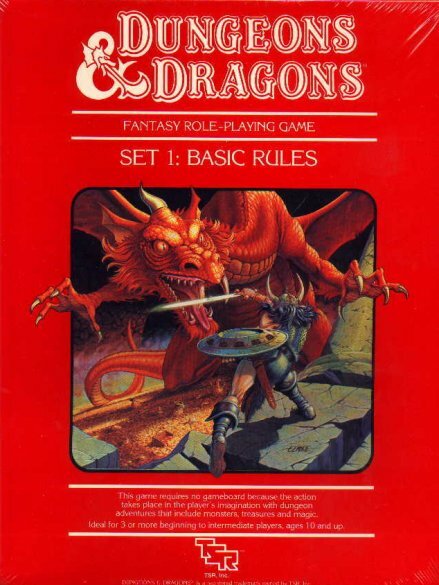 I will always and forever be a fan of 4th Edition D&D. It was what got me back into the game after so many years away. I love battle maps, my collection of dozens of miniatures, and my Dwarven Forge set. I love the complexity of the characters, and the ease of balancing encounters for the DM. My favorite part of 4E was the capability of making showstopping final combats with a whole variety of wicked foes, masses of minions, and crazy environmental effects. Some of my favorite D&D memories were made during 4E. But as I watched my son reading the Player’s Handbook that night, I thought back to the 2+ years we played 4th edition. I cannot recall him ever picking up a rulebook. He rarely even used the three pages of power cards for his Essentials paladin. The tight, complex ruleset that tickled my intellect was irrelevant to him. He just wanted to go to cool places, to act heroic, to swing his sword at the bad guys. I believe to some extent, 4th Edition was an obstacle to what he really wanted from Dungeons & Dragons. If the amount of time he has spent reading the Player’s Handbook the past few weeks is any indication, 5th Edition is just right for him. The entire system is easier to learn and master. Characters have plenty of options, but are still unique from one another. The quotes from D&D novels he’s read, the fluff embedded throughout the book, and the gorgeous, evocative art throughout have led my son to take the PHB with him on long trips in the car, to read before bed, or when he gets home from school. He’s eating it up, and I am thrilled, incredibly pleased, that he is getting such enjoyment from something that I have loved for years and years. Do I have concerns about Fifth Edition from a DM perspective? Yes. Balancing encounters is unintuitive, for one. I also feel there should be more options for variety in monsters like kobolds, orcs, and the like. Shouldn’t there be stronger or at least different goblins, troglodytes, and lizardfolk, just as there are elves, dwarves, and humans? I have some concerns about feats, as well. Some of them look like must-haves. I worry that feats will lead to overpowered characters. 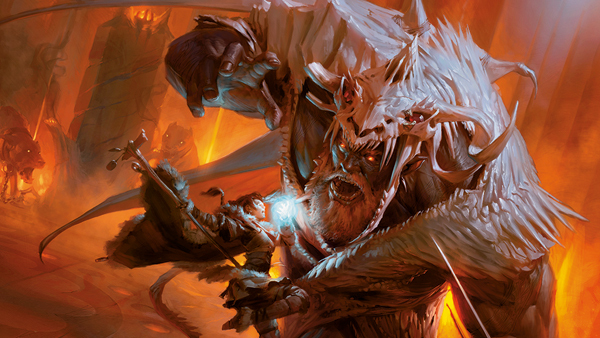 Perhaps the upcoming Dungeon Master’s Guide and Monster Manual will alleviate some of these concerns. But any misgivings I have about Fifth Edition are easy to overlook when I think of my son. We talk about D&D every day on the drive to school. One of the players in my new campaign wants to run a session soon, so I am making a character myself. We have talked about classes, abilities, which god to serve, what weapons to use, the background story, places we’ve been, even down to hairstyles of our characters. His excitement and enthusiasm are contagious, and it’s hard to worry about feats and balanced encounters when we talk about the fun stuff, the stuff that D&D is really about. The Three Pillars that 5th Edition has been designed around are exactly right. My kid wants to go to cool places, to act heroic, and to swing a sword at bad guys. That’s exploration, interaction, and combat, right there. Each is equally important, well-supported by the mechanics of the game. The rules are no longer a barrier to entry, something emphasizing one aspect of the Three Pillars over the other. My son is loving it, I am loving it, and it even looks like I will have two campaigns going on at the same time before long. The new Player’s Handbook is an amazing book, and I am thrilled to see what is to come from Dungeons & Dragons in the future. Next Best Monster Manual Ever? I also love 4e, but as I read through the Starter Set, my wife, who began playing D&D when I picked 4e up, told me she wanted to try a paladin, but none where available in the set, neither can they be rolled with the Basic Rules. What makes me want to have more 5e stuff is the fact that seems like an easier way to assemble solo adventures, and since we live far away from our friends, I usually run solo adventures for her. Paladins made it in to the 5E Players Handbook, just not the Basic Rules or Starter Set. They look pretty cool, but then, every class seems to have been written by someone who has been in a torrid love affair with the class for years.